EUDAT2020 worked on connecting the CDI to high throughput and cloud computing resources provided through EGI, integrating storage resources managed by EUDAT and computing resources available at EGI sites. This was demonstrated via two pilots involving ICOS and EPOS. Collaboration is now being continued as part of the EOSC-hub project. EUDAT2020 has worked with GÉANT to bring forward communities’ networking and AAI requirements and to ensure that the networking infrastructure on which EUDAT relies remains strong enough to meet its existing and future needs. Our work on B2ACCESS has been taken into account and has benefited AARC’s own developments. EUDAT is also collaborating with GEANT (and EGI) on an AAI use case for the Life Science community which is currently being piloted and is expected to be deployed as a service in 2019. EUDAT2020 has collaborated with OpenAIRE, ensuring that EUDAT services are compliant with OpenAIRE guidelines and discussing how to connect the two infrastructures through greater interoperability of the services and exchange of data. Concrete joint activities, including service integration, have been planned between EUDAT and OpenAIRE as part of the collaboration agreement between EOSC-Hub and OpenAIRE Advance. Through the launching of periodic PRACE-EUDAT joint calls for proposals, six (6) pilot projects have been granted to access services helping researchers manage, share and preserve data produced via numerical simulations. Thanks to this work, PRACE users have the possibility to apply for EUDAT resources to secure the outputs of their simulations beyond the normal duration of PRACE grants allocation period. EUDAT already provided data resources and services to PRACE projects for a total amount of 700 TB of storage space. A long-term sustainability plan for the contribution of resources is under discussion within the EUDAT CDI Council and will be finalized soon. EUDAT also worked with PRACE experts to harmonise access to both infrastructures through federated AAI, delivered joint training activities to PRACE users about Data Management practices and plans, and offered the central EUDAT B2SHARE instance to publish information material, publications, reports on results of PRACE resource allocation, white papers, best practice guides, etc. Finally, EUDAT and PRACE both contribute in the cross-organisation security workgroups (WISE). EUDAT2020 has provided continuous support to RDA since its beginning and has been working within RDA to foster interoperability at a global level and remove barriers for sharing and (re)using data. The participation and contribution of EUDAT2020 within RDA has been quite substantial, with over 50 individual members involved in the different working groups and holding key positions as working group chairs or in the governing bodies. In addition to the RDA Plenaries, EUDAT is regularly represented at the relevant RDA preparation and concertation meetings. EUDAT2020 has represented the CDI stakeholders in RDA (as organisational member of the General Assembly), coordinated EUDAT input and evaluated and implemented some of the RDA outputs such as the Data Type Registry and data management policies. 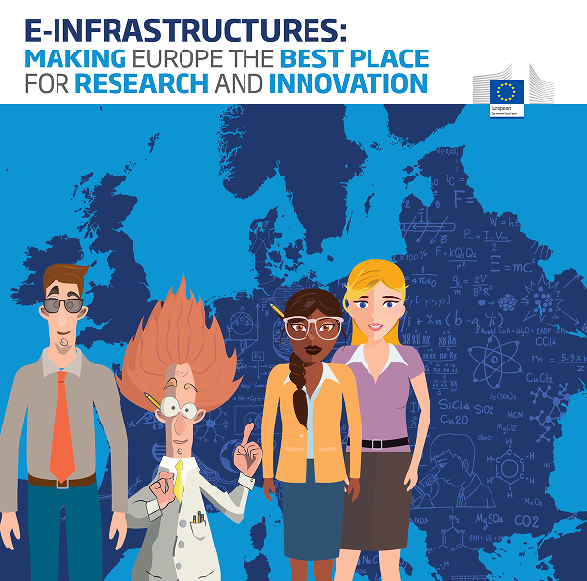 The E-Infrastructure & Science Cloud Unit of the European Commission (DG CNECT), created a booklet on the European e-Infrastructures in story-tale style, showcasing how Europeans from different sectors can work together using supercomputing and virtual environments to process and store large volumes of data. EUDAT is one of these e-Infrastructures allowing collaboration and data/know-how sharing and exchanging between Europeans, by providing them robust, easy and secure online services and solutions. Read the booklet to fully understand the potential of e-Infrastructures and understand how EUDAT and others can help you!